JOE Goldberg (Penn Badgley) is a bookstore manager who loves intensely; too much, it’s disturbing—the lengths he would go to. Peach Salinger (Shay Mitchell) comes from money yet is low on supply of love and hence, the desire for it. She oozes sass and loves deeply—obsessively, even. Both are always at odds with each other because of one thing: aspiring writer Guinevere Beck’s love and attention (Elizabeth Lail). 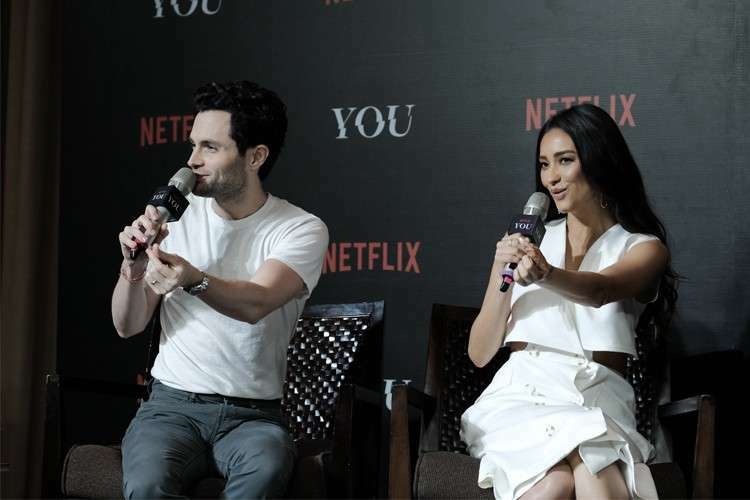 Although their characters are always butting heads, that’s certainly not the case for Penn Badgley and Shay Mitchell even if it’s their first project together. Badgley and Mitchell were in the country to promote the Netflix Original Series “You.” Based on Caroline Kepnes’ best-selling novel of the same name, the psychological thriller has been a worldwide hit since its release. Both stars met with the press last Jan. 14 at The Peninsula Manila, kicking off their two-day visit, before doing a fan event the day after. “I remember reading some of the scenes between Penn’s character Joe and Peach, and just imagining how I would play. Honestly, being on set and getting to work with Penn was 10 times more fun,” Mitchell shared. She also talked about some inside jokes they have, like talking to each other in a singsong manner to tease their co-stars Lail and Nicole Kang (who plays Lynn Lieser) who both love musical theatre. Of course for Penn, the feeling is mutual. 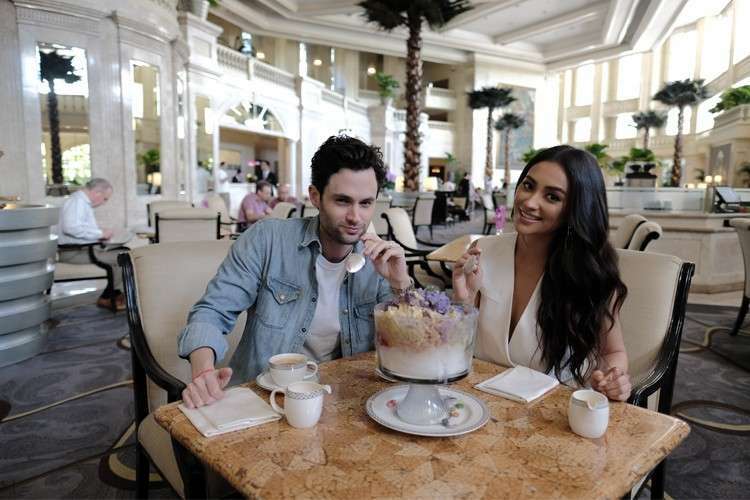 “I love working with Shay and I love doing press with her because I feel we’re quite different but we mix well—like the ingredients of ‘halo-halo,’” the actor said, in reference to the popular Filipino dessert both stars shared while visiting Manila. About”You,” both shared their experience how they got into their respective roles, and their thoughts on how viewers are reacting to the story, including some viewers who are romanticizing Penn’s character, Joe. “I’m not going to jump to conclusions. But yeah, sometimes I am worried that some people are forgetting, or maybe they’re not encouraged or encouraging themselves, to think about what they’re watching as deeply. I just want to encourage people to think about it deeply,” he said. “Everybody calls it a love story. It’s not. It’s a tragedy. But it kind of plays with you the whole time, leading you on just enough to hope that maybe, that’s not what’s going to happen,” Badgley said. Initially, Badgley was troubled with the script because of the role that he had to take on. Eventually, he was convinced through his conversations with Sera Gamble and Greg Berlanti, the creators of the show. “I enjoy it like you enjoy being scolded by a loved one. It’s not enjoyable at that moment but you know it’s good for you and it’s an enriching experience if you choose to learn from it. I think of the experience as being a lesson,” he said about playing the role. For Mitchell, it was refreshing taking on her role. Both were asked what’s to like and what’s not to like about their characters. “Well, that’s easy—everything except that he’s curious, and that’s not bad alone. But that’s not all he is,” he said, laughing about his character’s murderous tendencies. “I like her sassiness and I love saying those very quick one-liners. That was so much fun. I dislike her insecurity because having to play off that insecurity, which she definitely had, was the whole reason why mean girls are who they are. They’re mean because they’re insecure and that’s who I grew up with in high school,” said Mitchell, who shared about her experience of being bullied at that time of her life. No matter how viewers can’t help but either love or hate the characters, it’s always fun when these two are in the same frame. “I love the head-to-head nature of the relationship once it gets there,” said Badgley. “Just to have that sort of, like, back and forth with Penn’s character... It’s hilarious,” added Mitchell. “You,” now available on Netflix, tackles topics like relationships, friendship and how social media could be a powerful weapon to wield or be the cause of destruction of love, whether in its purest or distorted form. In the end, it is a show that makes one think—something Badgley and Mitchell hope viewers would do.